From time to time you may encounter different situations when you want your enterprise beans (both @EJB and @Inject – aka CDI) to be injected independently from the EJB container. Usually in these situations you have no access to any EJB container at all. Such situations can occur when running integration tests, applications where a piece of functionality has to be available on both (non-enterprise)client and server side and many others (there must be other cases… I can’t really think of any right now, but I am certain they exist). Well in these cases you’ve got to inject your stuff somehow, unless you want to end up with a bunch of NullPointerExceptions. Implementation (dummy) can be found here. Also watch out for your beans’ JNDI names. Once the OpenEJB container is up and running you should see those JNDI names in the container’s logs. If there are no JNDI names there, take care, OpenEJB might not be working properly (or the log is switched off). As you can see, using this solution you need not modify your existing code, which is a big plus. There is no boilerplate code generated, you’ve got both CDI and EJB support, no external configuration (unless you explicitly want to add some), in short; it’s really easy to use. However it’s really unlikely to already have OpenEJB on your classpath, so you have to add “several” jars to make it work. 3.297 secs. Yep, that much. The good news is that as you can see only the first test (which gets to initialize the container) will run that long, the second one completes literally in no time. Spring is also a free tool, you can download it from here. This file basically is divided into two parts: first you define your beans, then you describe what bean gets injected into which one. The good news is that there is no difference between CDI and EJB beans, no different syntax, they are treated uniformly. Huh. org.springframework.beans.factory.BeanCreationException: Error creating bean with name 'atmFacadeImpl' defined in file [C:\Documents and Settings\T\blog\Bank\.\resources\applicationContext.xml]: Error setting property values; nested exception is org.springframework.beans.NotWritablePropertyException: Invalid property 'receiptCreator' of bean class [bank.trans.AtmFacadeImpl]: Bean property 'receiptCreator' is not writable or has an invalid setter method. Does the parameter type of the setter match the return type of the getter? 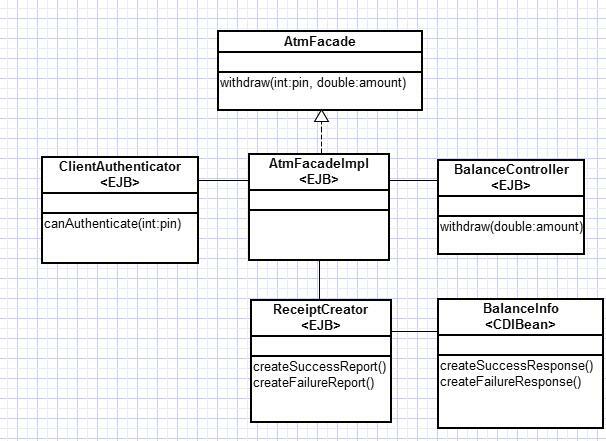 Caused by: org.springframework.beans.NotWritablePropertyException: Invalid property 'receiptCreator' of bean class [bank.trans.AtmFacadeImpl]: Bean property 'receiptCreator' is not writable or has an invalid setter method. Does the parameter type of the setter match the return type of the getter? 1.422 secs. The first test, again, initializes the object graph, the second one runs extremely fast. However, using this solution you get some boilerplate code; and of course, whenever you rename something (I often do that) you have to edit the context xml file too. In return, you get faster runtimes, and much higher chance that you already have Spring on your classpath (as Spring can really do a bunch of things). Also note how cleverly can Spring understand the javax injection annotations along with its own @Autowired annotation. I like that very much, very smart feature. I guess many other alternatives are out there, some of them might even be easier to use. These two options I have experience with, that’s the reason they were presented here.